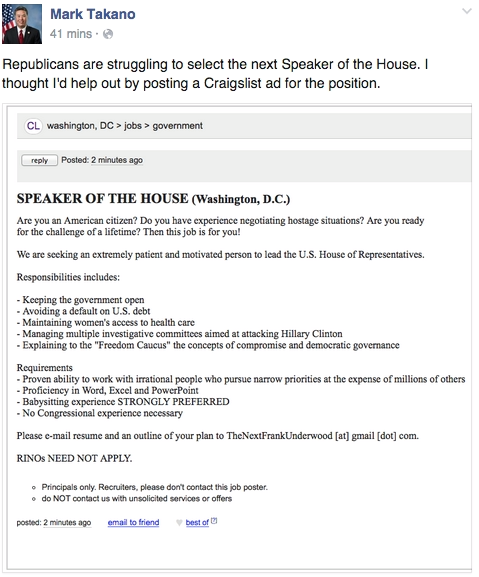 Rep. Mark Takano (D-Calif.) pulled a pretty nice troll on the Republican party by posting a Craigslist job listing looking for a new Speaker of the House. Takano wrote out the ad and then posted a screencap of the ad on his Facebook page. Here’s the text of the ad. This job actually looks pretty easy, by the looks of the post. Are you an American Citizen? Do you have experience negotiating hostage situations? Are you ready for the challenge of a lifetime? Then this job is for you! We are seeking an extremely patient and motivated person to lead the U.S. House of Representatives. Please e-mail resume and an outline of your plan to TheNextFrankUnderwood [at] gmail [dot] com.